While we are away, Royal Mail have sent advices to standing order customers but not, as far as I can see, to dealers that more new Machin counter sheet printings will be distributed on 23 May. These are ‘Non Visible Changes’ and will be automatically sent by RM to their customers who have these on standing orders. As these have an official day of issue we will produce a limited number of FDCs to order. If you are interested please let us know as soon as possible. Miniature sheet probable for Royal wedding on May 19th. I’m told there will be an additional issue of special stamps on May 19th, which will cost £4.44. This sounds like a miniature sheet consisting of two each 1st class and £1.55 stamps, as with previous Royal Weddings. Per a comment below, this is confirmed, but not by Royal Mail, as being a miniature sheet for the Royal Wedding. As these stamps have almost certainly been delivered to us at home, pictures will be supplied as soon as possible. Although Royal Mail will once again keep this a secret until the last possible minute, I think it fair to say that at the last briefing they said that IF they managed to get agreement for the issue and the designs in time to have it printed the wedding stamps would be issued on the day of the wedding albeit that that is a Saturday. Update 14 May: the sheet and pack have now appeared on eBay, just under a week before the issue date. Blog access fixed, Website update, New stamps, and more postal forgeries. Hope everybody had a good Easter break. I've had trouble again with the software used to upload files to the website. Every time Apple releases a new version of the Mac operating system the transfer software fails and a new version has to be created. There is often a few days' delay while this is done. You have probably noticed (or maybe not) increasing use of secure websites even for information-only pages. This is partly because Google and other search engines are giving priority to sites which have secure (https://) access over those which only have http://. For our main website this matters little, apart from dumping us way down search engine results compared with where we used to be when we were allowed (by Royal Mail) to publish news rather than acknowledge their new stamp issues. I recently changed the set-up for the blog (which is powered by Google) which meant that some bookmarks did not work, and there was no feed to our website. That's now been fixed with a new version of the feed link, so if you are on our home page you can see if there is anything new here. Update: I've been told that the new feed has links only on the individual entries not on the blog title, meaning that to see other posts you have to click on 'next' or 'older posts'. While I work out how to change this, there is a workaround. Once you get to any blog post, if you click on the blog title "Norvic Philatelics Blog" at the head of the page, it will then refresh to show a page-full of blog, starting with the most recent post. And if you go there, you will see that there are now new pages showing good resolution images of the Reintroduced Species stamps out next week on 17 April, and the 10 x 1st class stamps showing adult and juvenile Owls to be issued on 11 May. It would have been better if those had been issued in March, but of course with the Centenary of the RAF celebrated on 1 April, the stamps had to be issued around then - so why not on March 28th, perhaps, with the new rates so that they would at least see some postal use after people were made aware of the anniversary. They could have been advertised during the tv programmes! Roughly once a week I get emailed by either recipients of surcharged mail, or people who have bought stamps on eBay to use, and are suspicious. Most of the recent enquiries I have been able to identify positively from the images sent. 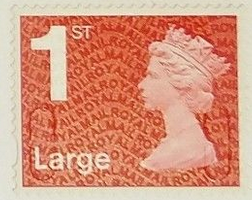 The latest batch of 1st class Large business sheet stamps has two glaring errors: no source or date code, and a bar-code in red instead of blue. Many modern forgeries are difficult to pick up from photos and almost impossible from scans. But all red stamps must have dates from 2012 or later. If no year code, then they smell - and not of rats, but if powerful chemicals used in the printing process. The picture alongside was taken from an eBay listing, so I could even see that it was 'wrong' without buying it! Royal Mail know who is selling these, but I suspect they want to trace the supply route back at least part way to its source. Whatever happens, the consumer ends up paying, either with a surcharge or with higher postage rates than there needs to be. As I mentioned at the end of March, our shop is now closed temporarily giving time for some packing and a short break. (Yes much shorter than the long one!) There may be some new Machin definitives while we are away; but we know that the 2nd class books of 12 with February 2018 packing dates still contain M17L stamps, so there is no sight yet of any M18L other than those we know about already. We'll be back after the Mayday holiday, but may have access to allow comments through while we are away. Post Office makes overpricing refund easy - at last! After several weeks and much prompting I have now had a reply from Post Office Ltd about the over-charging of the Country Definitive Presentation Pack (see here). I can confirm that any customers that have been incorrectly charged for the Philatelic pack, can receive a refund of the difference in branch; they will just need to show their receipt. So to those who were overcharged, and haven't destroyed their counter receipt, you now have the opportunity to get that 15p back! As previously announced there will be no Royal Mail P&G presence at the Scottish Philatelic Congress in Perth this year (20-21 April). However, the offshore islands and Gibraltar have been persuaded to attend and IAR reports that they will each be dispensing two types of stamps. Congress organisers have confirmed that there will be no facility for orders by post this year. With Royal Mail having postponed attending events and having looked at previous years it was felt there was not a significant demand for Jersey stamps. Collectors who are interested in obtaining these stamps are advised to contact the relevant postal authorities who may be selling them via their bureaux.